1. 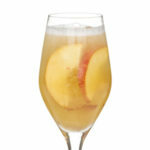 Pour the White Peach Puree into a Champagne flute, add vanilla syrup and cranberry juice. Top off with sparkling cider. Garnish with an edible flower.